The second pillar is salah (prayer) which is an act of worship comprising of specific movements, which include standing, bowing and prostrating to the Lord of the Heavens and the Earth. The prostration is conducted by placing one's forehead on the ground, in a state of abject submission and utter humility from which arises a sense of contentment. Meanwhile, the tongue recites holy words: words that the Lord spoke; the articulation of tasbeeh and tahleel, while also supplicating. This prayer leads to accomplishing an act of worship that is realised in the heart, soul, and the spirit of man. It connects the created to the Creator, and it is cause for guidance to descend from the heavens. The third pillar is the zakah, a wealth that a rich person presents from his available property that it may be distributed amongst the poor and those who fall under the category of the zakah's recipients. The believer forces himself/herself to give and spend in ways that are pleasing to Allah and thereby secure themselves from the ensnarement of this worldly life and devotion towards it. Instead, he enables his soul to search for the needy and develops within it the desire to help others. In doing this, the soul is purified of its spiritual illnesses and is thereby facilitated in connecting with its Lord. The fourth pillar is the sawm (fasting) which is an act of worship entirely different from salah. It requires the believer to refrain from consuming food and drink, as well as from satisfying sexual desires, from sunrise to sunset, for approximately thirty days. Although the body fasts, so too does the heart. The body is weakened to the extent that it may experience debility and need, and hence causes the believer to turn to Al-Qayyùm (One who is Self-Sustaining). The believer turns to the Most High in a monotheistic nature actualising His Oneness in the heart thereby. Hajj is a pillar that differs from those previously mentioned. It is an act, the performance of which is dependent on one's location; whereby one undertakes a journey that could well be lengthy and arduous to Makkah. Journeys are normally undertaken for some business venture or for the purpose of leisure, but in all cases, it contains some kind of benefit, one also acquires many new experiences from visiting another country and seeing new cultures. In the case of the Hajj, our journey is one of worship, so the pilgrim acquires these benefits in addition to others. "Announce Hajj to mankind. As for leaving your house and making your way to the Sanctified House, then for every step you take, Allah will record one good deed for you and efface one sin. During the pilgrim's journey, spiritual preparation begins in earnest for this unique experience to the holy lands. 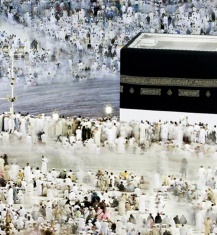 The pilgrim enters a spiritual state individually, communally, and physically by entering into Ihram, a situation entirely different from the one he/she was in previously. The pilgrim discards the vast majority of worldly connections and dons two simple white sheets which are sufficient to cover his `awrah. In this way, the pilgrim has no way of boasting about his clothes, no means of competing with others in aesthetics. He/she cannot have marital relations, and he/she is not even allowed to contract a marriage. During these days, the body has no time to give in to its base temptations; ahead of it are demanding and eventful times. In order to perfect this spiritual preparation, one is prevented from other actions as well: applying perfume, clipping nails, and cutting hair. The pilgrim uncovers his head that he may sense submission and humility. The pilgrim proceeds to his destination in this state, articulating the talbiyyah in a loud voice. Not a single stone or tree hears him except that it also recites the talbiyyah along with him. The tongue articulates these words, but the very being trembles at it; the pilgrim is in a state wherein his sincerity is entirely for Allah, not worshipping anything besides Him - his heart, his spirit, his life and death is all for Allah. On the 8th of Dhul-Hijjah, the pilgrim enters or returns to the state of ihram so that he can commence and complete the rites of Hajj. The first of the major rites is to be present at the plain of 'Arafah on the 9th of Dhul-Hijjah. This is the greatest pillar of the Hajj as the messenger (peace be upon him) said "The Hajj is 'Arafah". It is an awe-inspiring event where hundreds of thousands of people from every corner of the globe; from different cultures, different civilisations, different races gather together in one specific part of the earth. If they are not present at this gathering, their Hajj is invalid. More than two million people gather together in this place, wearing the same clothes with their heads bare; united in making the tahleel which is the best of supplications. La ilaha illAllah wahdahu la sharika lahu." They supplicate to their Lord seeking forgiveness and success in this life and the next. With the last minutes of daylight, the Muslim exerts himself in supplication until the sun sets. At dusk, the multitudes of people start moving - walking and riding - raising their voices with the talbiyyah, all of them moving as one to Muzdalifah to spend the night there. There they also pray the Fajr of the Day of 'Eid al-Adh'ha. After Fajr, they once again move on, this time to Mina. Upon arriving there, they stone the Jamraat, remembering thereby the action of Ibrahim before them who stoned the Shaytaan when the devil ordered him to disobey his Lord. The pilgrims then slaughter the sacrificial animal as an act of worship to draw them closer to Allah, the Mighty and Magnificent. Then the pilgrim shaves his head or trims her hair "and regarding shaving your hair, for every hair that falls off your head, you will have a good deed." At this juncture, the pilgrim partially leaves the state of ihram on the Day of 'Eid, so he can resume wearing his normal clothes and perfume himself. The pilgrim now makes his way to the Ka`bah and makes tawaf. This is a pillar of the Hajj which if omitted, the Hajj becomes invalid. The Prophet said "When you make the tawaf of the House, you emerge from your sins in a state like the day your mother gave birth to you." After this tawaf the pilgrim completely leaves the state of ihram and all its restrictions are lifted. The pilgrim returns to Mina and spends the night there. The next morning is the first of the Days of Tashriq, and these are the days of eating and drinking as the prophet informed us. During these days, the pilgrim stones all three Jamaraat after midday, "As for the stoning, it is stored for you (i.e., its reward)". The stoning is repeated on the second day, on which the pilgrim can end his Hajj if he wishes; if not, he/she can add a third day of stoning. "Remember Allah on the designated days. Those who hurry in two days have done no wrong, and those who stay another day have done no wrong: those of them who have taqwa. "4 Thereafter the pilgrim can end his Hajj by performing the Farewell tawaf and then prepare for the return journey home. Everything in this world must come to an end, even this action of worship. This act of worship which is from the most delectable and fulfilling of actions comes to an end. Does its toil and hardship cease? Its sweetness never ceases. However, deep impressions and moving experiences linger on in the heart. The connection with Allah remains, the sense of His Greatness, love of Him, desire for what lies with Him, the love of meeting Him, and the relinquishing of everything besides Him remains. He is the Lord, He is One, He is the Strong, and He is the Subduer. I bear witness that none has the right to be worshipped save Allah alone with no partner, and I bear witness that Muhammad is His servant and Messenger.